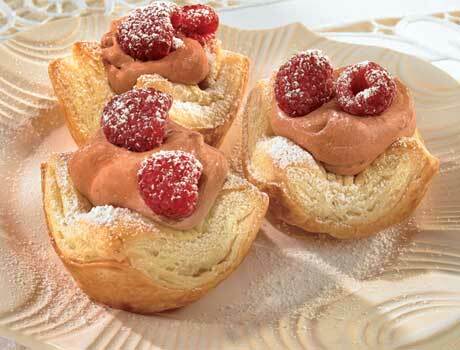 Muffin-shaped tartlets of puff pastry are filled with a light and creamy chocolate-raspberry cream. 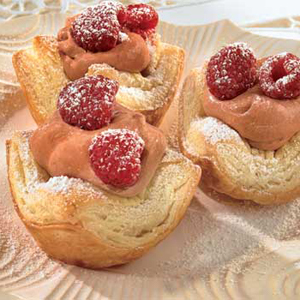 Puff pastry sheets make this whimsical dessert easy for any night of the week. Heat the oven to 375°F. Lightly grease 24 (2 1/2-inch) muffin-pan cups. Sprinkle the flour on the work surface. Unfold 1 pastry sheet on the work surface. Roll the pastry sheet into a 9 x 12-inch rectangle. Cut into 12 (3-inch) squares. Repeat with the remaining pastry sheet. Press the pastry squares into the muffin-pan cups. Brush the edges of the pastry squares with the egg. Bake for 10 minutes or until the pastries are golden brown. Let the pastries cool in the pans for 5 minutes. Remove the pastries from the pans and let cool completely on wire racks. Stir the pudding mix and milk according to the package directions in a large bowl. Stir in the jam. Fold in the whipped topping. Spoon about 1 tablespoon pudding mixture into each tartlet shell. Refrigerate for 10 minutes. Top with the raspberries. Sprinkle with the confectioners' sugar. Recipe Note: To make 12 larger pastries: Substitute 2 packages (10 ounces each) Pepperidge Farm® Puff Pastry Shells for the pastry sheets. Bake pastry shells according to the package directions. Spoon about 2 1/2 tablespoons pudding mixture into each pastry shell. Top with the raspberries. Sprinkle with the confectioners' sugar.